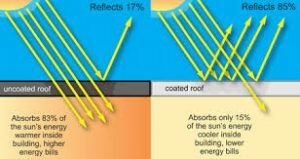 A two year study by the Queensland University of Technology (QUT) in Australia finds that a cool roof coating can lead up to a 30% reduction in air conditioning load by reducing the amount of heat entering a building through its roof. According to Architecture & Design, the study focused on a sample of houses, schools, offices and retail spaces and revealed that the special reflective white paint reflected 88 per cent of the sun’s energy. In comparison, a standard light colored roof reflects less than 65 per cent of the sun’s energy, while a dark roof reflects less than 25 per cent. “We saw average energy savings of between five and 30% across the range of buildings, with most buildings showing savings above 15 per cent,” said Professor John Bell, head of QUT’s School of Chemistry, Physics and Mechanical Engineering. Onsite monitoring of the temperature and electricity usage of 16 buildings at 10 sites found that the coating led to temperature reductions in three areas — the roof surface, roof cavity, and non-air conditioned internal spaces. According to QUT Senior Research Fellow Dr Wendy Miller, who ran the project with Professor Bell, it is a combination of color and chemistry that made the roof coating effective. Generally, light colored materials reflect more sunlight and absorb less energy than dark colored materials. Low thermal mass materials also emit heat quicker than high thermal mass materials. 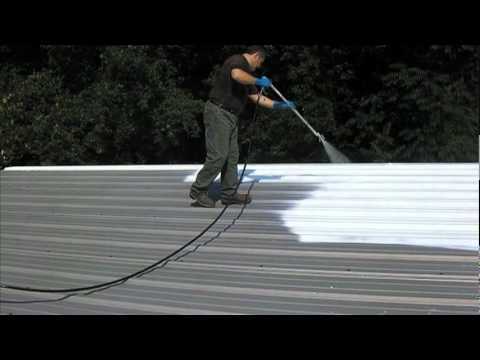 Dr Miller says the economic benefits of cool roof coatings are greatest for single story buildings, buildings with aged, dark or medium colored roofs, buildings with no or low levels of roof insulation, and buildings with high air conditioning use.